Over the last few seasons we have seen the growth in popularity and demand for sculputral and structured knitwear inspired by catwalk collections. 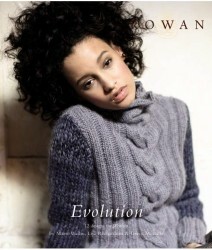 Evolution is a reaction to this trend, while utilising some interesting knit techniques such as pleating, short row shaping and cast-on and cast-off effects. This contemporary collection of 12 designs for women embraces these new shapes and stitches, creating dramatic knits that are easy and desireable to wear. The essential knit collection for the serious hand knitting fashionista.